Corneal Implants Market size is set to exceed USD 500 million by 2025; according to a new research report by Global Market Insights, Inc. Rising incidence of eye diseases across the globe will foster the corneal implants market growth in upcoming years. According to WHO, cataract, glaucoma and corneal blindness are some of the major reasons of vision loss and prevalence of these conditions is rising. In India, it is predicted that 6.8 million population have vision less than 6/60 in at least one eye because of corneal diseases. It is further predicted that patients with unilateral corneal blindness will raise to 10.6 million by 2020. Such stupendous increase in incidences of corneal diseases will upsurge demand of corneal implants, thereby, fostering the business growth. 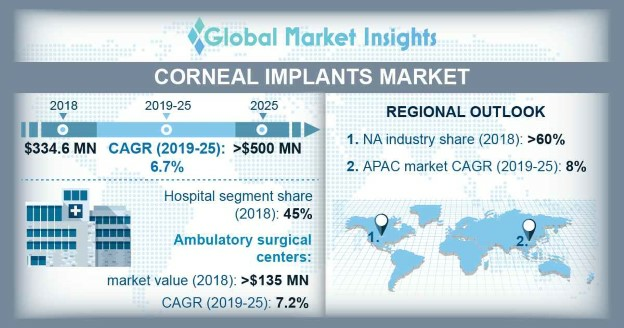 Growing geriatric population in developed economies will propel corneal implant market growth over the forecast period. Geriatric population is prone to various chronic diseases such as diabetes that may lead to several corneal diseases including superficial punctate keratitis, persistent epithelial defects, corneal endothelial damage and recurrent corneal erosions. According to NCBI article, diabetic conditions are responsible for 12,000 to 24,000 incidences of blindness in U.S. each year. Wide range of applications of corneal implants in the treatment of corneal diseases will augment industry growth over forecast timeframe. However, shortage of donor material coupled with taboo associated with organ donation may impede the industry growth to some extent. Keratoconus segment held more than 25% revenue share in 2018. Rising awareness among people related to corneal topography for keratoconus diagnosis will boost the segmental growth. Keratoconus is one of the most prevalent condition in adult as well as teenagers. Detrimental environmental conditions such as increasing global temperature, depletion of ozone layer is predicted to increase its prevalence rendering significant positive impact on segmental growth.